Tokyo-based audio manufacturer Zoom has announced the upcoming release of its new R24 recorder. The digital recorder builds on the capabilities of Zoom’s older R16 model with the addition of a sampler/drum machine, 8 additional recording tracks and 6 channels of phantom power. and a drum pad sampler. The R24 records on SD memory cards and supports cards up to 32GB for over 100 track hours of recording. The flexibility of SD recording makes the R24 lighter and more reliable. 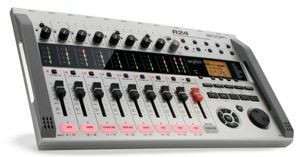 In addition, the R24’s USB audio interface allows users to record tracks to any Mac or PC and utilize the system’s control surface capabilities to manage the functions of most DAW software programs, most notably Cubase LE 5, which is included with the recorder. The Zoom R24 will be available July 7, and is distributed in the US by Samson Technologies.